There is an inevitable step along the decent into fountain pen madness when flexible nib curiosity sets in. "Flex" nibs, as you might guess, have a bit more spring than a traditional nib. Selectively applying pressure while writing spreads the tines to vary your line width for some extra creative flourish. At a street price of around $20, the Ahab is seemingly a great starter option. But I was turned off by reports of quality issues. Since I've had great success with Pilot pens at all price levels, I decided to stretch to the Falcon's $115 street price. 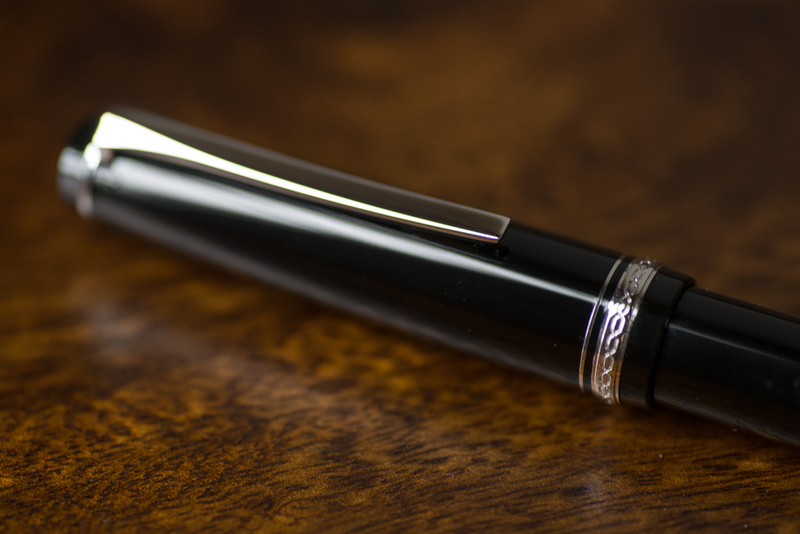 The Falcon is a fairly conservative looking black pen with rhodium accents. It's not going to turn any heads from a distance, but upon close inspection the quality shows through. While the outward appearance of the pen isn't anything flashy, I do like it. It's almost as though the pen body is yielding respectfully to the star attraction: the Falcon nib. The Falcon's 14-karat gold nib has a very distinctive hooded design. It really looks great. 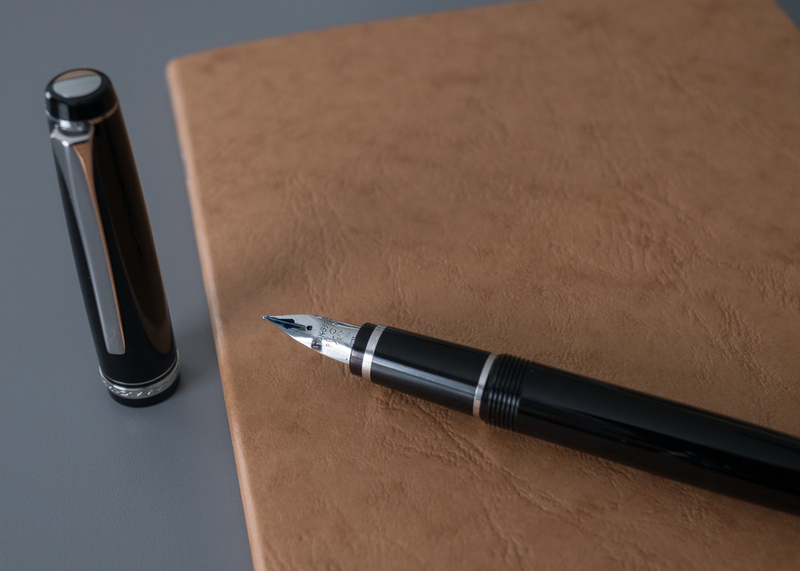 While many fountain pen nibs have a throwback look to them, the Falcon's nib screams modern performance. The Falcon is offered in both metal and resin versions. I opted for the less expensive resin version, which is not a major compromise. The quality level remains quite high. The pen is lightweight but solid. The cap threads have just the right amount of resistance. I'm usually somewhat ambivalent about clips, but the Falcon's clip feels like the best of both worlds to me. It has some nice tension to it, which I prefer. But it also has a nice curve to it towards the end, which makes it easier to affix than most clips. The Falcon's writing experience is not what I expected it to be, but it's probably my fault. It turns out that the Falcon nib is not really a flex nib after all. 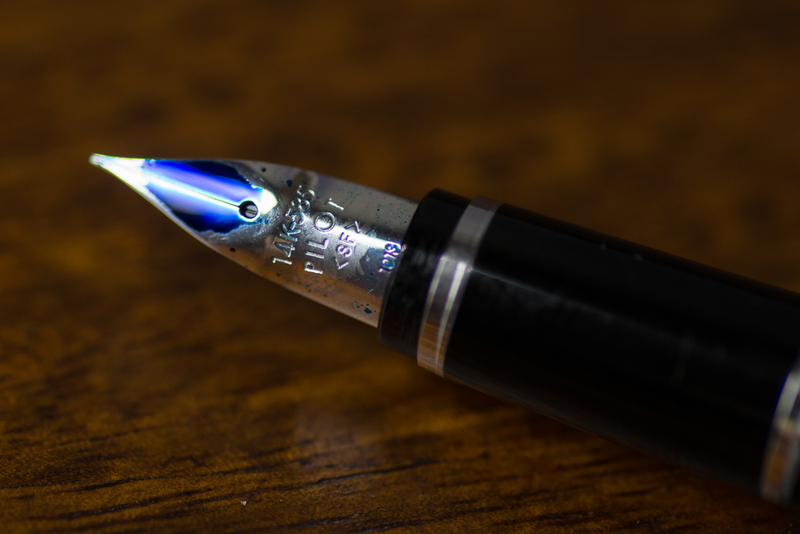 It's better described as a really nice nib that is more flexible than the norm. You can get some line variation, but it feels a bit forced to add more than a slight amount of additional pressure. I initially chalked this up to the fact that I'm a flex nib novice, but upon further investigation I learned that this is expected behavior. I was briefly disappointed that my first flex nib isn't really a flex nib. 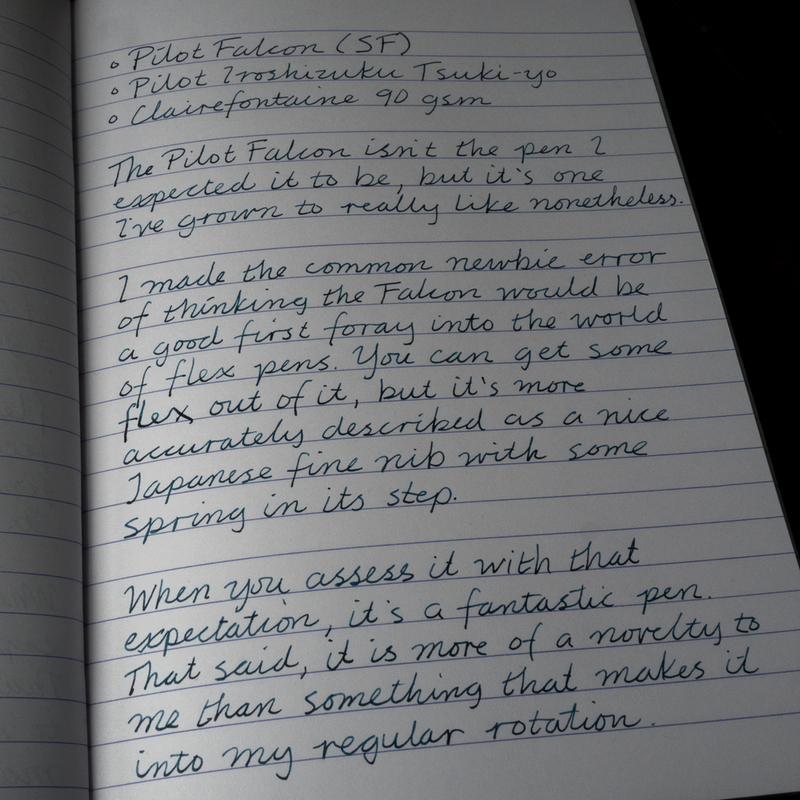 But once I got past the fact that I wasn't "doing it wrong," I was able to enjoy the fact that Falcon writing experience is actually pretty fantastic. Pilot medium nibs are a proven sweet spot for me, but I opted for the soft fine on the Falcon. I'm really happy with the choice. I've enjoyed dipping a toe into Japanese fine territory, but the extra bounce in the nib keeps the writing experience in my comfort zone. At approximately 5.35 inches (136mm) long capped and 5.9 inches (150mm) posted, the Falcon about average in size. I prefer to use it posted, but it's quite usable unposted as well. As with most cartridge/converter pens, the Falcon is relatively easy to flush out. It flushes easily with my bulb syringe, or you can use the standard converter twist method. You can often find the resin Falcons in the $115 range online, which I think is an excellent value. It comes in a little less than other popular entry level gold nib pens like the Pilot Vanishing Point and the Lamy 2000. 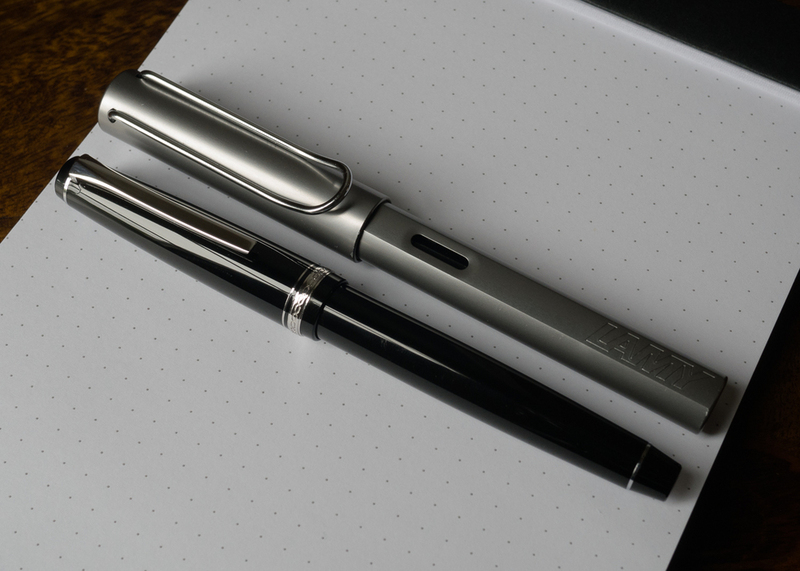 The Vanishing Point and Lamy 2000 have a bit more going on from an overall design standpoint, but the Falcon's highly distinctive nib and writing experience earn it spot in the same price category. 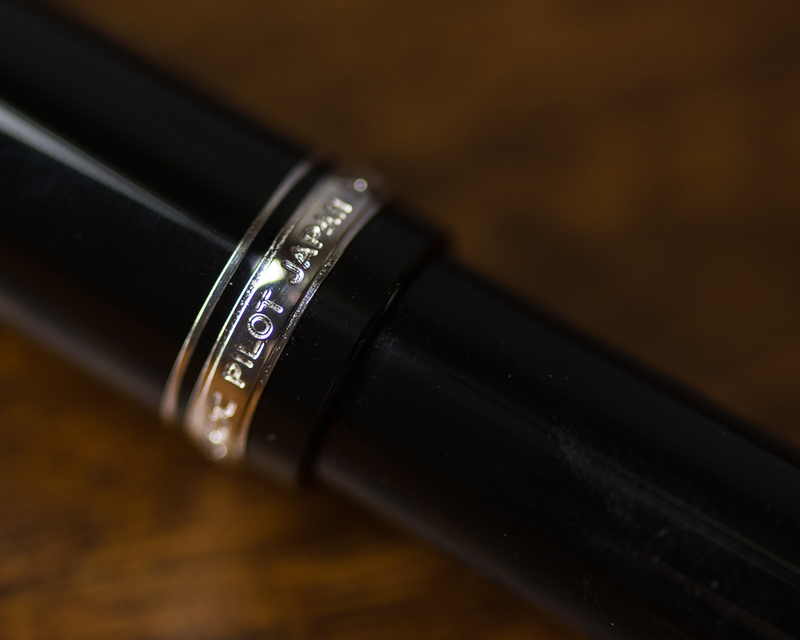 If you are looking for a true flex nib experience, a stock Pilot Falcon is not the right choice. That said, it's an excellent pen that I really enjoy using. The Falcon is not really a daily workhorse pen for me. I tend to reach for it as a change of pace, or when I want to have some fun with a new ink acquisition. John Mottishaw of Nibs.com offers Falcons for sale with the option of a special "Spencerian customization" for added flex. (If you haven't already seen it, there is an amazing YouTube video of this modification in action. Richard Binder can modify both Pelikan and JoWo nibs to create either a semiflex or full flex effect. If you have any flex nib suggestions of your own, I would love to hear about them in the comments below, on Twitter, or via e-mail.